RIASC Seminars are now available online!. Once you are registered and logged in, use the link https://ariadna.unileon.es/course/view.php?id=400 to enrol: access is open to everyone! The Research Institute of Applied Sciences in cybersecurity (RIASC) organized a program aimed at senior students of high school in order to provide an overview of cybersecurity approached from a technological perspective labor and industrial progress. This course aims to get young people, especially high school students, are aware of the interdisciplinary nature of cybersecurity, acquire basic concepts on cybersecurity and provide a first contact with methodologies and exposure of ordinary skill in university teaching before pursue higher education or enter the workforce. INCIBE and the Universidad de León are interested in conducting unique research activities in cybersecurity because they believe that the proper functioning of any element of a system of science, technology and innovation requires the involvement of all actors, public and private. Existing agreements between the Universidad de León and INCIBE aim to develop different research teams in cybersecurity, with the aim of creating different lines of research related to cybersecurity. Achieving these goals will be done through various actions. Studies and scientific and technological advice. Projects and technical advice and expert opinions. The actions focused on the establishment of training programs investigadors, teachers and students in cybersecurity, with the firm intention to meet a market need. They may create subgroups research to generate new techniques, materials, products and services for the prevention, detection and response for the fight against cybercrime. The Universidad de León will carry out the selection process of research personnel necessary for the provision of personal media and INCIBE provides the hardware and software components needed for projects. They may even pose different lines of work with other entities within the public safety, with the aim of supporting initiatives that contribute to knowledge lamejora continuous qualification of professionals in cybersecurity. The Master in Security Technologies has been taught by the Universidad de León in collaboration with INCIBE for six editions. The seventh edition will begin on November 6, 2015. Under the direction of Miguel Vieira Carriegos. The specific interest of the teachings fits into the current need to train professionals in security technologies and communications and generate talent and encourage the training of highly qualified professionals in the field of cybersecurity, in order to adapt to market needs the skills taught. It is a well-known master, coming to show their interest foreign universities. Puedes ir a su página web aquí. Given the growing importance of cybersecurity in all both social areas such as economic, has identified the need to create a forum where the various actors working in the field of research in cybersecurity (universities, technological centers, companies, and agencies government ) can share their work and experiences with the common goal of advancing research in the field of cybersecurity nationwide. 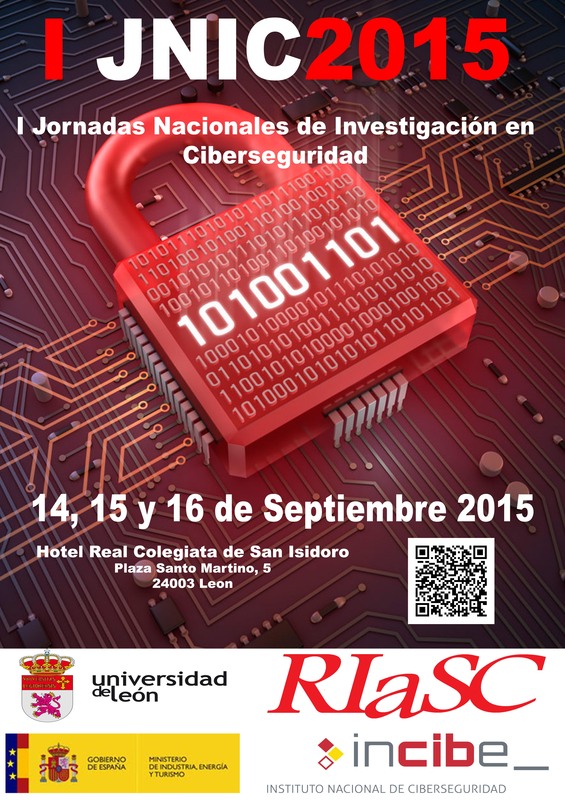 To this end The I Jornadas Nacionales de Investigación en Ciberseguridad (I National Research In Cybersecurity Conference), where his first edition was held in León are created, on 14, 15 and 16 September 2015. Educación e Innovación en Ciberseguridad. Education and Innovation in Cybersecurity. The organization of these I Jornadas Nacionales de Investigación en Ciberseguridad (I National Research In Cybersecurity Conference) is carried out by the Universidad de León, with the support of INCIBE representing the Network of Excellence in R & D in Cybersecurity (acting as framed as 25 in the Plan Confidence in the Digital environment 2013-2015. The desire of the Organization is that this event successful in its first edition and which gives rise to the organization of future editions led other teams in the country. This summer course is mainly focused on master students, who want to start research in cybersecurity, and doctoral students freshmen who are doing the thesis in the field of cybersecurity. However, the potential audience are also students of degree courses last interested in research and young researchers, seniors, or other professionals interested in the field of cybersecurity. Critical infrastructure. Modeling and analysis of property insurance. Secure communication networks. Models and future architectures. Threats systems. Types and analysis. The role of national public institutions against attacks on critical infrastructure. Patia is a web application that provides insider privacy-related applications on iOS, whose project manager is Vicente Matellán Olivera. You can find out at a glance what type of data is potentially accessible by iOS applications. Patia incorporates a database with information about many iOS applications. The list of applications available will grow over time as soon. The information provided is the result of an automatic analysis of free iOS applications available on the App Store Spanish. The analysis was performed using software developed by the GISSiM group. Checks whether an application has API functions of IOS that could access personal data. If the application is actually using the data or not. GISSiM group and The Universidad de León are distributing this information as academic dissemination of their research results without any implication or claim for the safety of these applications. To use Patia go patia.unileon.es on your computer, tablet or phone. Examine the list "Top 400 Free Apps" or search for your preferred application in the "All Apps" section.